The best alternatives to a dehumidifier depend on the causes of the humidity, the room's features and your budget. Excess humidity promotes mold and mildew, yet running a dehumidifier can have a major impact on your electric bill. You may need more than one alternative method to dehumidify a damp room, and in some cases, expert help may be needed. 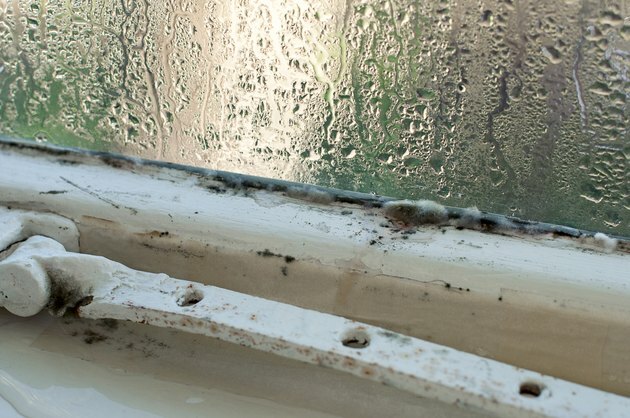 Condensation from excessive humidity can damage window frames. Run a fan to reduce dampness in a humid room. Keeping the air moving reduces water vapor. Use a window fan to improve ventilation if the room has a window that will accommodate one. Get a model with an exhaust setting so you can vent dank air before blowing in fresh air. Open windows often if the outside moisture is lower than the inside moisture. Better ventilation can stop condensation on walls and windows, reducing the risk of mold. Keep a humidity meter in the room to gauge the effectiveness of the improved air flow. Hardware stores supply these. Run an air conditioner if you have one. Contemporary air conditioners dehumidify while cooling the air, and advanced systems have separate controls for adjusting humidity, such as by setting it to a comfortable 60 percent. Place containers of desiccant in the room. These include commercial products designed to draw moisture out of the air with calcium chloride, a salt crystal. You can get this material from home improvement and hardware suppliers. Check the containers once or twice a week to determine how often they need to be tended. Pour off the water that collects in the containers regularly. Add more dessicant to the containers as needed. Add more containers of dessicant if you're having to empty them more often than is convenient. Run a wood stove or space heater if it's safe and feasible to do so. Warming the air reduces humidity as long as you use a dry heat source, not gas heat. Turn the heat off or down before the room temperature reaches 95 degrees Fahrenheit; higher temperatures in a humid room could result in steam damage to the walls. Run a fan while heating the room for greater dehumidifying. Gryphon Adams began publishing in 1985. He contributed to the "San Francisco Chronicle" and "Dark Voices." Adams writes about a variety of topics, including teaching, floral design, landscaping and home furnishings. Adams is a certified health educator and a massage practitioner. He received his Master of Fine Arts at San Francisco State University.